Polina P is a professional freelance Makeup Artist, working with private clients in Baltimore, Maryland USA. Polina shares her talents worldwide through her social media platforms in creative makeup, featuring one of a kind eye and lip pairings to complete inspirational beauty looks for her 60k+ followers on Instagram + YouTube. She never repeats her creative looks and always shares mini-tutorials on how to achieve these captivating techniques with her followers. Polina is truly a master in detailed, wearable, yet intriguing bold beauty looks, but is also a highly sought after freelance Makeup Artist with a focus in stunning soft, natural, and perfect bridal makeup looks for her lucky clients! Polina first began her Makeup Artist training through a Master Class with the world famous Makeup By Mario, notably known for celebrity clientele, including a favorite amongst beauty influencers, Kim Kardashian. She started her YouTube + Instagram pages to begin sharing her stunning artistry - this is how we had the pleasure to connect with her. Polina reviewed our Essential Makeup Artist kit and went on to completing our Makeup Artist course, earning her second certification with us at the Online Makeup Academy. 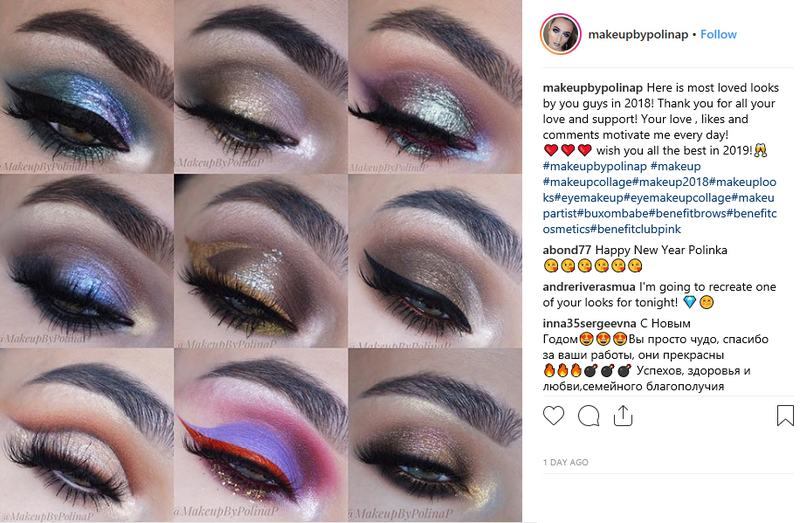 We loved Polina’s work and continued a collaboration where Polina was featured as our guest blogger, writing many of our top articles (check out more of the blog page for some amazing professional tips on brushes, makeup application, and more - all written by Polina exclusively for the Online Makeup Academy!). As she continues to build her brand as a beauty influencer others have also taken notice, she also partners with Cargo Cosmetics as a Beauty Ambassador, and many other brands look to her for collaboration. Check out Polina’s video below of our (original) Essential makeup kit review and Essential Makeup Artist course review, some of our favorite makeup looks by her, and be sure to follow her YouTube channel and Instagram @makeupbypolinap for more inspiration, tips, and tricks. We love Polina’s educational story, and hope it will inspire others to reach for the stars! Remember, creating an Instagram (and/or YouTube) focused business page where you can consistently share content, professional style images, and can provide a unique point of view to your followers will be the best form of promotion that you can build in this current digital age of social media. Focus on building your own individual brand identity, sharing your view and techniques as you begin to build your career - this will help lead you towards the path for continued success (and you will connect with a great community of like minded artists along the way)! When you are beginning your career as a professional Makeup Artist, and completing your training with a makeup school, you’ll hear and read a lot about improving your technique (with good reason!). This drive and desire to improve should carry on with you well beyond your completion of your studies, as a Makeup Artist there is always room to learn, and always new techniques to improve on and even ways to find a more efficient way of executing a certain look that you already know. The way that you execute and improve your individual techniques, is entirely up to you as the artist, however there are quite a few methods that can increase your productivity and help you to be the best Makeup Artist that you can be! There is nothing that will help you more than practice. Practicing on yourself, your family and friends, and eventually models will allow you to establish a variety of different techniques which will become second nature. It’s all about trying a look on different faces, eye shapes and skin types. Only after you feel comfortable with doing a look on a multitude of faces, can you say that you are on the right track to mastering a technique. This way, once you show up at a professional job, there will not be room for error. Yes, practice is the base, but experimentation will take your artistry to the next level. We are not just talking about experimenting with colors and playing around with individual techniques to make them your own, but also about trying different professional products and tools. You’ll never know what one new tool will replace two others in your kit and make your life that much easier. It’s also about what tool or type of brush you feel most comfortable executing a certain style with. What feels best in your hands is based upon individual preference; a truly successful Makeup Artist will figure out their own unique way of doing things through experimentation. This might sound like we are taking you back to school, but there are a few classic makeup books (and a variety of material available online!) that you’d be amazed at how much they can teach you on techniques. You’ll find loads of tips and how to’s that you might not have heard of before! A favorite makeup book is hands down Kevyn Aucoin's Making Faces. This book is a must have for aspiring Makeup Artists who are looking to learn the fundamental basics of beauty. Even if it was written in 1997, the steps here are still very useful and incredibly applicable today – classic beauty techniques never change! You'll find applications and techniques in this book, but also a lot of ways to create a variety of looks. Some additional books that are recommended are Bobbi Brown’s Makeup Manual, Beauty and Living Beauty, this book will help you with executing a perfect natural makeup technique. Thanks to today’s trends and society, we literally have access to everything by just the click of a button - millions of makeup tutorials, articles, and inspiration pictures are at your fingertips. As a professional Makeup Artist you should consistently research new how to’s, trends, and innovations. Another incredible option is to browse through archives of old runway shows to view the makeup, and become inspired by the world of fashion, which is so closely intertwined with Makeup Artistry! To see the progress in your work, always keep a record of the beauty looks you have tried. It is always a good idea to take a before and after picture. This way, after a while, you can go back and see what worked and what didn’t. Trust us, it is so much fun to go back and see how much your technique has improved! Sometimes you will not recognize your own work, and that’s the confidence boost you may need to practice more and more, and the encouragement to continuously strive to improve! This might seem useless as you go further in your career, but going back to the basics might truly be the best option. In makeup education, it is all about the foundation, what you learn and establish at the beginning of your journey. So whenever you feel like learning, consider going back to the beginning, watch tutorials and techniques that you learned ages ago, you may pick up something (with your added experience!) that you didn’t notice before! After you have had some experience, you’ll see these “basic” techniques with a much different eye, and this will bring another layer to your Makeup Artistry execution. Improving your technique is about hard work and dedication. It is also about your desire to become better. Realistically, there is no such thing as perfection, but you should be aiming to be the best that you can be at all times. Take out your kit, find your inspiration and aim to become the best makeup artist out there. Oh and quick tip: don’t forget to have fun while at it!